THE PERFECT LUNCH? 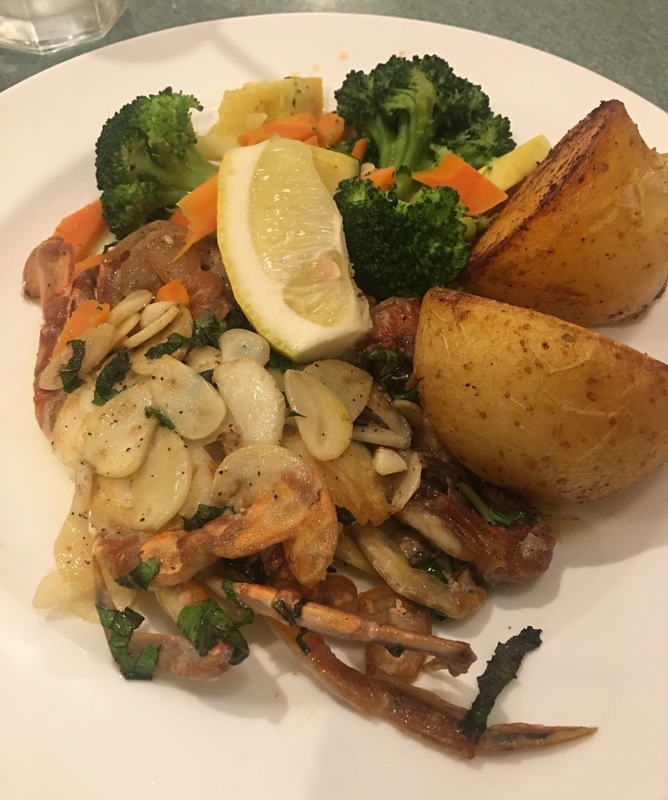 Two Soft-Shell Crabs, sauteed in olive oil and smothered in garlic, came with roasted potatoes and a steamed vegetable medley at Seafood Gourmet, the fish market-restaurant in Maywood. MEATY SEAFOOD? We need a new word to describe crabs with a lot of, well, crab, besides "meaty," a reference to beef or other meat. HACKENSACK, N.J. -- Summer can bring oppressive heat, but the season also offers great eating for pescetarians and other seafood lovers. 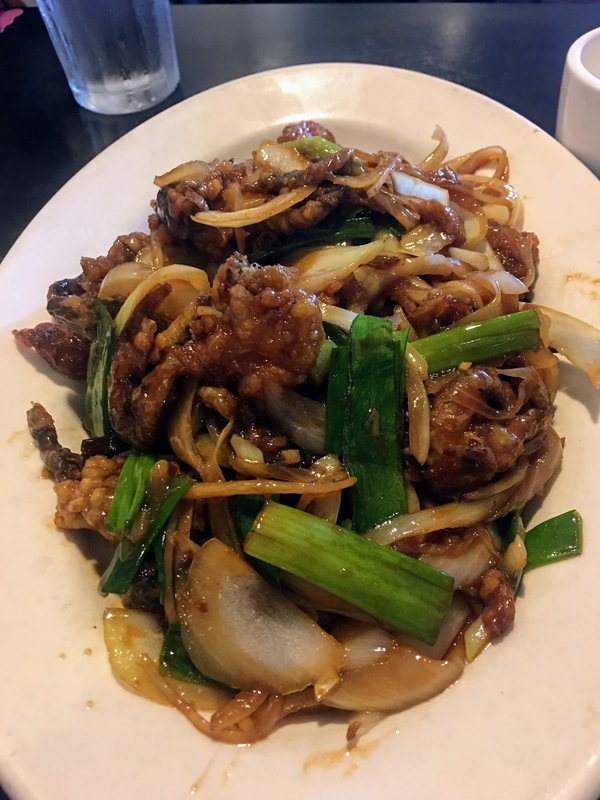 Fresh, wild Sockeye, King and Coho Salmon are widely available in markets, and Soft-Sell Crabs are on the menu at Lotus Cafe in Hackensack, Seafood Gourmet in Maywood and many other restaurants. IN THE CASE AND ON THE PLATE: At Seafood Gourmet, Soft-Shell Crabs are available in the market, lower left, and in the BYO dining room, where my filling lunch was $18. The fish-market restaurant is at 103 W. Pleasant Ave., Maywood. Closed Sundays. With less than 40 seats. reservations are recommended for dinner (201-843-8558). AT LOTUS CAFE: Our dinner for 3 included bite-sized Soft-Shell Crabs with Ginger & Scallion ($22.95), above; Filet of Sole in Garlic Sauce ($17.95), Fried String Beans Szechuan Style ($11.95), Boiled Seafood Dumplings ($7.95), and Pork & Pickled Cabbage Soup for 2 ($5.95). SALT & PEPPER: We're planning to return to Lotus Cafe to try Salt & Pepper Soft-Shell Crabs. The Chinese BYO is at 450 Hackensack Ave., in the Home Depot Shopping Center, and is open 7 days. 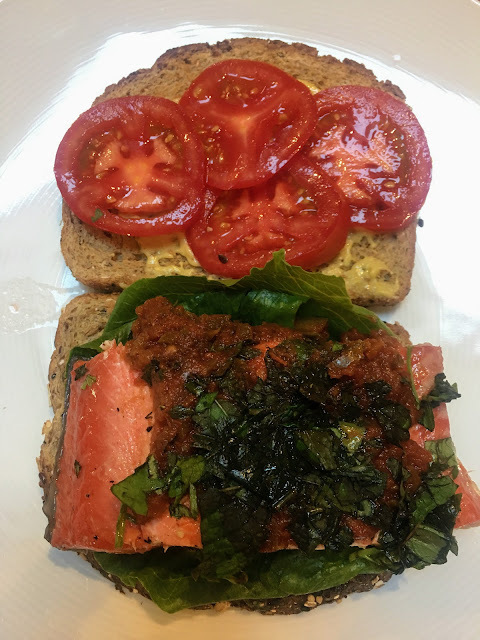 FRESH WILD SOCKEYE SALMON: My favorite way to eat a leftover Sockeye Salmon Fillet is right out of the refrigerator on toasted slices of Dave's Killer Bread, an organic loaf sold at Costco Wholesale in Teterboro, spread with pesto or Dijon mustard, above and photos below. 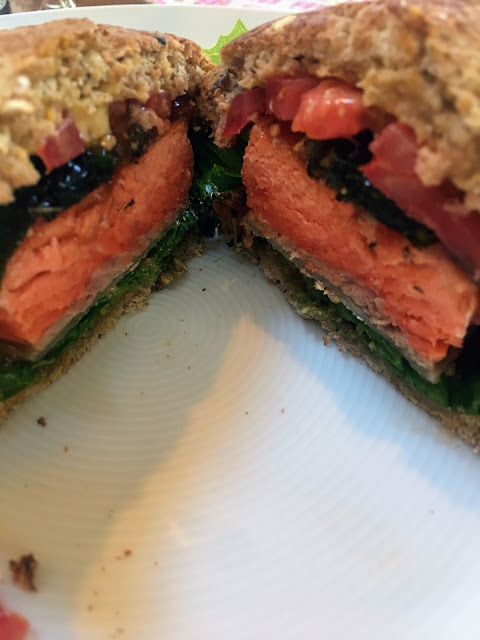 SMOKED WILD SALMON: An over-the-top Sockeye Salmon sandwich includes silken slices of Kirkland Signature Wild Alaskan Smoked Sockeye Salmon from Costco, above and below. 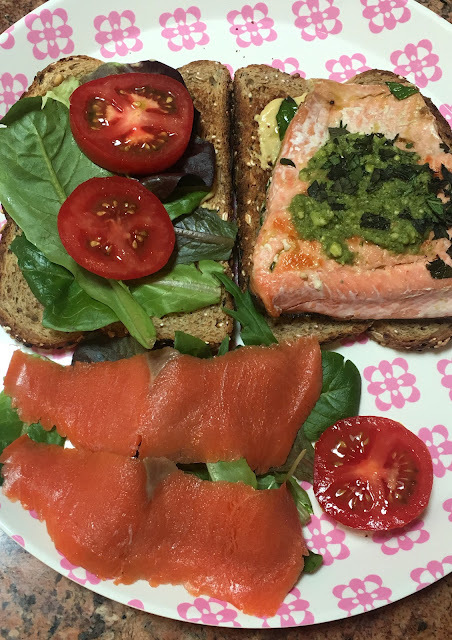 AMAZON PRIME DEALS: Last week, fillets of fresh, wild Sockeye Salmon from Alasaka were $13.99 a pound at Whole Foods Market in Paramus or $6 off per pound for Amazon Prime members. STOVETOP GRILL: I preheated a stovetop grill that straddles two burners over a medium flame, added spray oil and cooked serving pieces of Sockeye Salmon for 3 minutes skin-side down and then another 3 minutes on the other side for medium-rare. I topped them with organic Mexican-style salsa, heated separately, and fresh herbs from my garden.